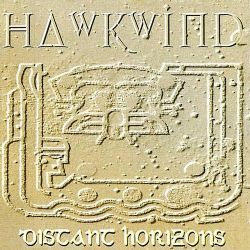 ATOMHENGE, the home of HAWKWIND s catalogue from 1976-1997, continue their series of definitive reissued editions of these classic albums with the release of DISTANT HORIZONS. The album, originally released in 1997 on the Emergency Broadcast label, Featured a line-up of DAVE BROCK, RICHARD CHADWICK, RON TREE and JERRY RICHARDS and took Hawkwind s Space Rock style into a new era, absorbing Ambient and Electronic influences to create a set of tracks that was both contemporary and classic Hawkwind. Featuring excellent material such as Taxi for Max, Alchemy, Phetamine Street and Wheels, this Atomhenge reissue has been newly re-mastered to the usual high standard and is presented with a new deluxe booklet with new essay.